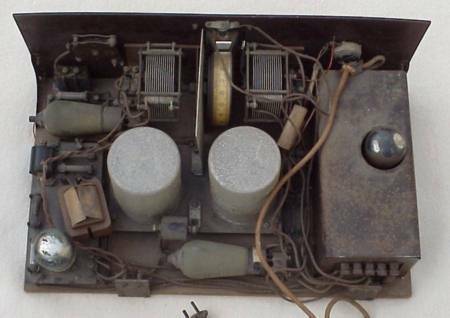 This radio was sold as a home construction kit to its adherents by a Dutch broadcasting organisation (KRO). It was built by Cornelis Tol from Zaandam in the Netherlands in 1932 or 1933 and donated to my collection by his grandson. The radio survived the second World War and the years thereafter. 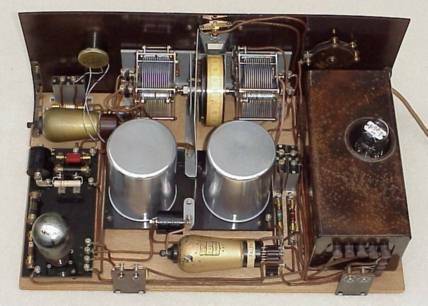 According to Cornelis Tol's son the radio still was in a working condition in 1952. 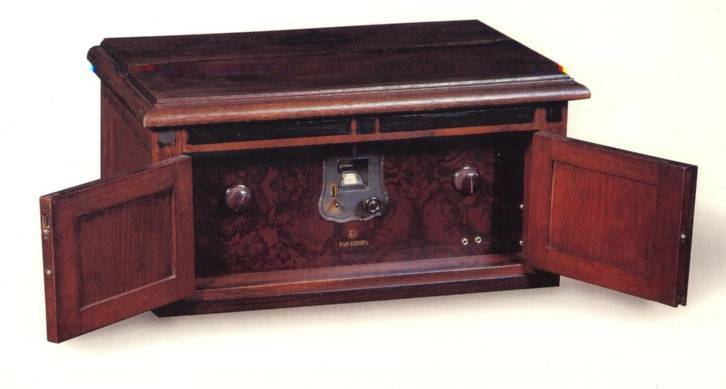 This radio was described in the Dutch quarterly magazine "Radio Historisch Tijdschrift" no 2 of 1998 by Mr. F.J.J. Driesens. 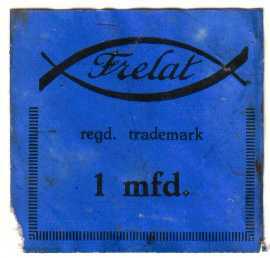 Most parts of the kit were manufactured by Frelat, located in Amsterdam, with the brand name "Elfre". This holds a.o. for the power supply (model VI), variable capacitor and coil set. Details are described in several advertisements and editorials in the Dutch radio periodical Radio Expres of 1932. The radio covers two bands (with automatic switching): 200-600 and 1000-2000 meter. Tube line-up: E446 (HF amplifier) and E462 (Detector), LF amplifier (probably C453) and rectifier 506. A high impedance loudspeaker or ear phone has to be connected externally. The radio had collected dust and the contacts were quite rusty. Most resistors and capacitors had increased in value substantially. It further turned out that some modifications were made compared to the original circuit. The potentiometer was replaced by another type with an other value and it had switched place with the variable antenna capacitor. Some capacitors had been replaced by newer types, obviously because they were leaky and the LF-choke was a replacement as well. I decided to dismantle the radio completely and cleaned all parts (including the 50 pieces of wire). I repaired one of the HF-chokes as it appeared to be interrupted. The left picture shows the choke in opened up situation. In stead of the LF-choke a resistor of 80 kohm was mounted, upon recommendation of the article mentioned above. All resistors were built in glass tubes (right picture) and very far off from original values. As I did not manage in opening up the tubes and replace the interior, I replaced the resistors entirely by species with the proper value but from different construction. 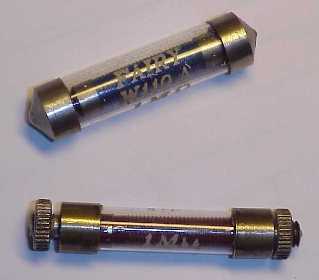 Several capacitors were built in similar housings, but with plastic in stead of glass tubes. Those could easily be opened and new high quality components inserted. All block capacitors were emptied, filled with new components and closed again (label on capacitors shown left). Both tuning capacitors were dismantled and cleaned. The pictures at the right hand side show one of the capacitors before and after treatment. At the right of the capacitor a switch is visible which effects switching between the two wave bands. 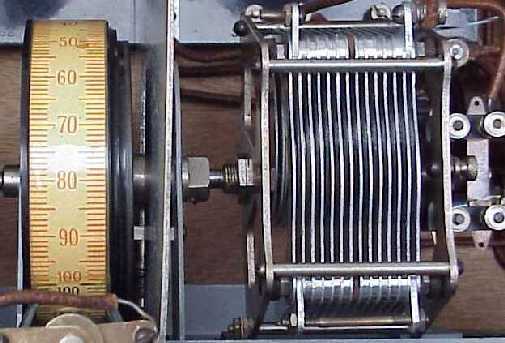 During 180 degrees rotation of the variable capacitor one band is active and during the remaining 180 degrees the other one. Also all block capacitors in the power supply unit had to be replaced, as those were quite leaky. The resistors were replaced as they were very far off original value, whereas two resistors (R3 and R4) appeared to be burnt out. I did not find the schematic for this power supply (type VI), so I decided to draw it up myself (schematic). The picture (left) shows the power supply with the cover and rectifier 506 removed. 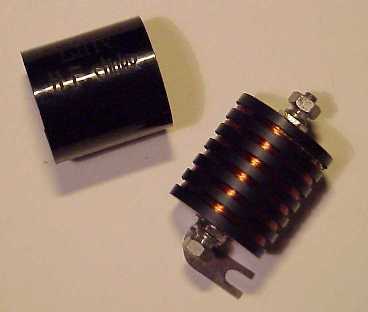 The isolation of the variable antenna capacitor was severely damaged (right picture), which resulted in a short circuit. I replaced the damaged isolation. 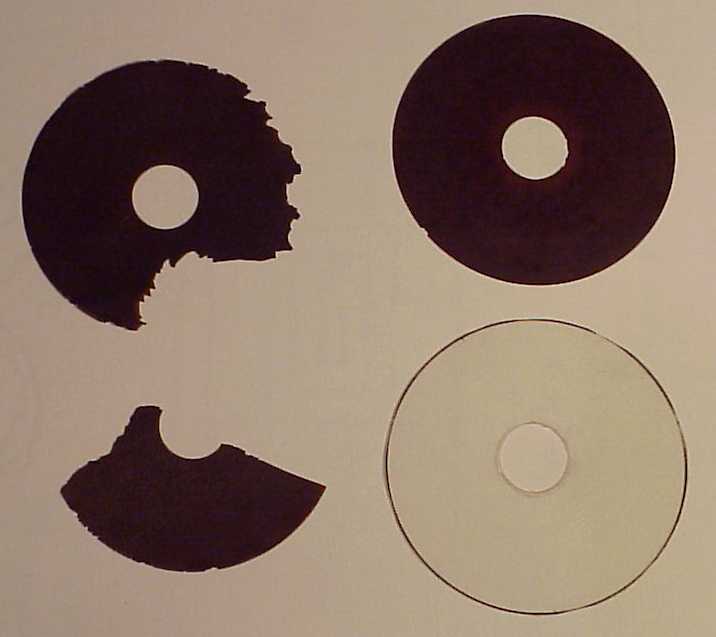 The new isolation was made by cutting 14 circles with the proper size from transparant sheets, used for presentations. With a hole punch the centre hole was made. 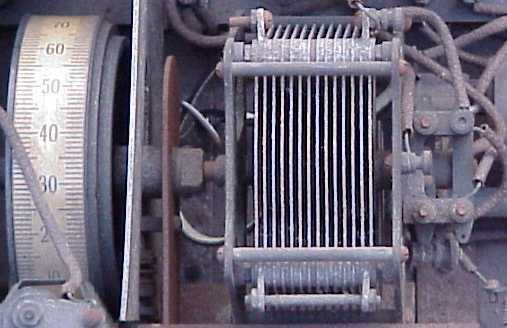 The potentiometer was replaced by a type with an appearance more close to the original one. 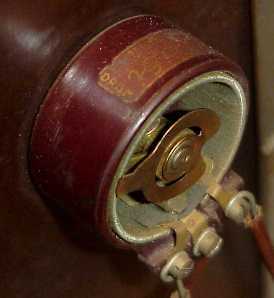 A picture of the original potentiometer with a resistance of 400 ohm is shown at the left. I still hope to find the original part some day. 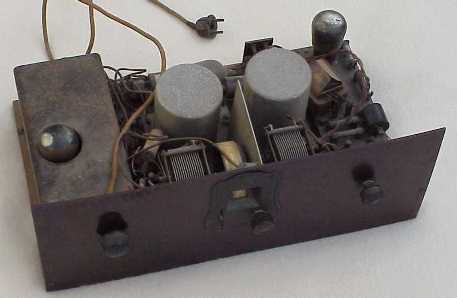 After having mounted all parts and wires again (in accordance with the detailed instructions in the original manual), powering up the radio and connecting a high impedance loudspeaker, several stations could be heard.